string(1025) "Resource Centre > Uncategorized > Green Carbon Black Trade"
The vast majority of deforestation and illegal logging takes place in the tropical forests of the Amazon basin, Central Africa and Southeast Asia. Recent studies into the extent of illegal log- ging estimate that illegal logging accounts for 50–90 per cent of the volume of all forestry in key producer tropical countries and 15–30 per cent globally. Meanwhile, the economic value of global illegal logging, including processing, is estimated to be worth between US$ 30 and US$ 100 billion, or 10–30 per cent of global wood trade. A number of certification schemes and programmes have evolved to reduce illegal logging. These schemes, such as vol- untary trade agreements including the EU Forest Law Enforce- ment, Governance and Trade (FLEGT) Voluntary Partnership Agreements (VPAs), or Forest Stewardship Council (FSC) certification, have been successful in bringing stakeholders together and generating incentives for legal exports and more sustainable forestry. The Convention on International Trade in Endangered Species of Wild Fauna and Flora (CITES) is increasingly being used by states to ensure that trade in listed timber species is legal, sustainable and traceable. Around 350 tree species are now in- cluded in the three CITES Appendices, and trade in their prod- ucts is therefore subject to regulation to avoid utilization that is incompatible with their survival. CITES is also working with the International Tropical Timber Organization (ITTO) to pro- mote sustainable forest management and to build the capacity of developing states to effectively implement the Convention as it relates to listed tree species. The main aim of the above mechanisms are to promote sus- tainable trade. 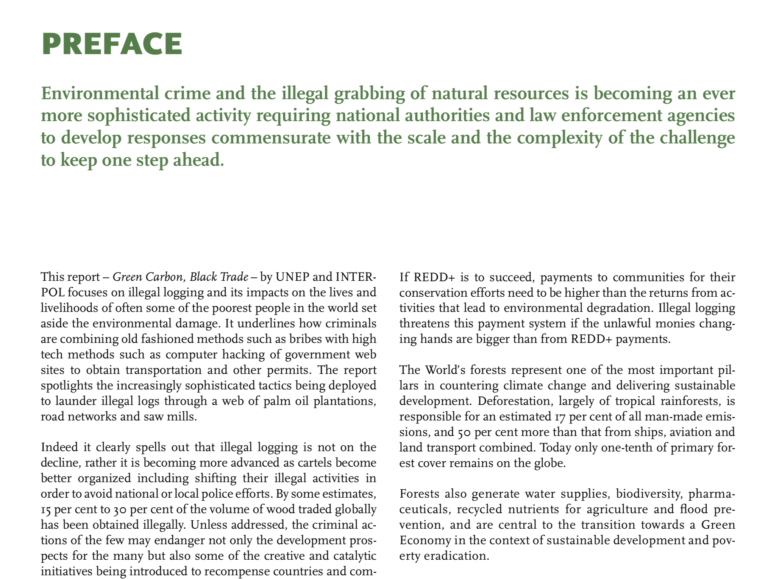 With the exception of CITES, they were not designed to combat organized crime and are not effective in combating illegal logging, corruption and laundering of ille- gal timber in tropical regions. Other incentives and subsidies to offer alternative incomes are unlikely to be effective when illegal logging and laundering offer much higher profits and very low risk. Widespread collusive corruption from local of- ficials to the judiciary, combined with decentralized govern- ment structures in many tropical countries, provide little or no economic incentive for illegal loggers and corrupt officials to change their practices. To become effective, voluntary trade programmes and the ef- fective implementation of CITES, must be combined with an international law enforcement investigative and operational ef- fort in collaboration with domestic police and investigative task forces in each country. This is to ensure that a local decline in illegal logging is not offset by increases elsewhere, as interna- tional cartels move to new sources of illegal timber.